3D technologies are ushering in a new wave of digitalization, driven by consumer experiences in the automotive industry. V.S. Mahadevan, CEO, and Director, CSM Software Pvt. Ltd – A SOLIZE Company, provides his perspective below. As the role of sub-system suppliers is evolving from “print-to-part” suppliers to collaborative design partners, 3D technologies are becoming the platform for communicating product and all related information between the OEM and the sub-system supplier, creating a large, seamless and extended enterprise. All the major OEMs across the globe demand that their tier 1 supplier should be capable of collaborative design. In such situations, 3D technologies form the core of communication and information exchange. One of the leading global exhaust systems suppliers works in this framework with almost all global OEMs. This tier 1 supplier receives the full vehicle packaging information from the OEM and taking into consideration the performance requirements the supplier collaboratively designs the subsystem. As the OEMs move into new markets, they seek their suppliers from their home-market to be able to support them in the new markets as well. Due to operational constraints during the initial phases of addressing the new market, OEMs expect their suppliers to have at least the print-to-part capability. As the OEMs mature in these new markets, they expect the suppliers to evolve from print-to-part to a collaborative design partner as well. Today, the automotive industry is offering a wide choice of products and features to its customers. Consumers are demanding better features for lower prices and the competitive market scenario is demanding faster product launches. These aspects are driving the critical need for simultaneous value engineering to realize the market acceptable cost goals. Multi-Disciplinary Optimization (MDO) plays a critical role in addressing all these requirements suitably. Traditionally, MDO has been an engineering process. Today usage of 3D technologies provides the framework for inclusion of cost as a critical boundary condition in the multi-disciplinary optimization approach. This has now become one of the most imperative factors in the product development cycle. Another area where the application of 3D technologies is gaining momentum is in enhancing the customer buying experience in the form of virtual showrooms, product personalization etc. Inability to experience the desired product (variant & colour etc.) coupled with lack of an inability of the customers to visualize has been a critical sales challenge. Accordingly, one of the leading Indian automotive OEM and a European automotive OEM have been piloting the concept of the virtual showrooms for product configuration and enhancement of buying experience. Another new emerging application area is the usage of 3D technologies alongside virtual and augmented realities and motion technologies for evaluating the user preference of vehicle ride character and handling comfort. The 3D data user community is no longer restricted to just design or manufacturing engineers. It is expanding to include the vehicle test engineers, sales and marketing teams and the end customer as well. 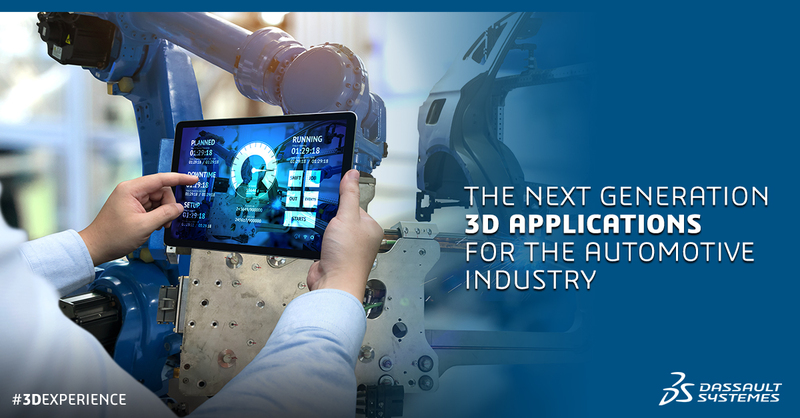 Summarily, 3D technologies have outgrown the traditional boundaries of product definition and manufacturing and are finding newer applications which are very important to the everyday vehicle user and expanding the scope for inclusion of the consumer in the vehicle development process.